My daughter, who was 10 at the time, taught this game to a group of gamers at a game store one NYEve night. We've since become great friends with those folks, one of whom I would consider amongst my best friends! All because of a game of Gloom. More people than you think may like making the characters miserable. The rules sheet notes that the game designer thought the game up because his wife hates playing games where you have to do bad things to the other players. Here, she gets to do good things to their characters, instead--thereby interfering with the other players. One other plus, and one minus. 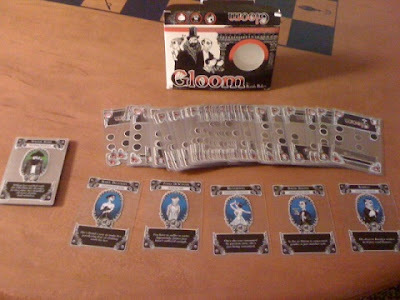 Gloom can remain interesting if you tell stories about the characters' lives as you play cards on them. The vicissitudes each experiences can be highly entertaining. The downside is, as card after card is added to characters, and thus their story unfolds, the game could overstay its welcome. This game is fun at an hour or less; beyond that, you may decide to just bring about an expedient end to the game.